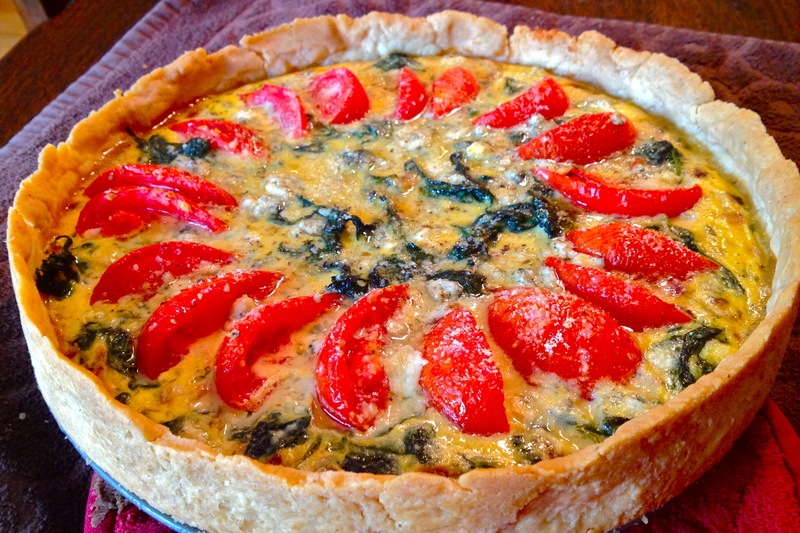 Spinach and Tomato Tart with Bleu Cheese. Most of the time, I like recipes that are quick and easy, require minimum dish-washing, and have an ingredient list that’s more like a haiku than a novel. Most of the time. But every once in a while, I am overcome with a sort of culinary patience and concentration that allows me to make a recipe like this one. 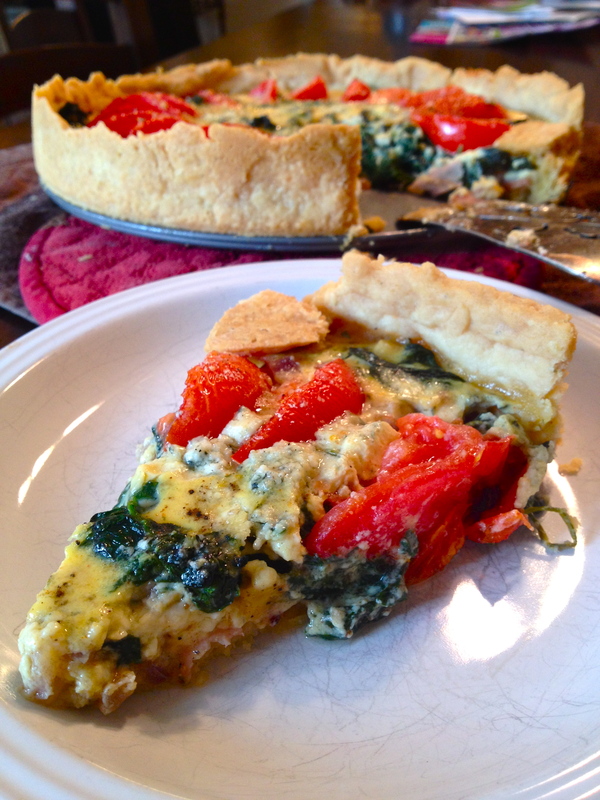 There are a few separate characters in this play: the tart shell, buttery and crumbly-good; the creamy filling, eggy and spicy; and the veggies themselves, that make this whole thing totally worth it. So if you’ve got a good 2 hours or so and you really want to spoil yourself with something rich and beautiful, this is your guy. 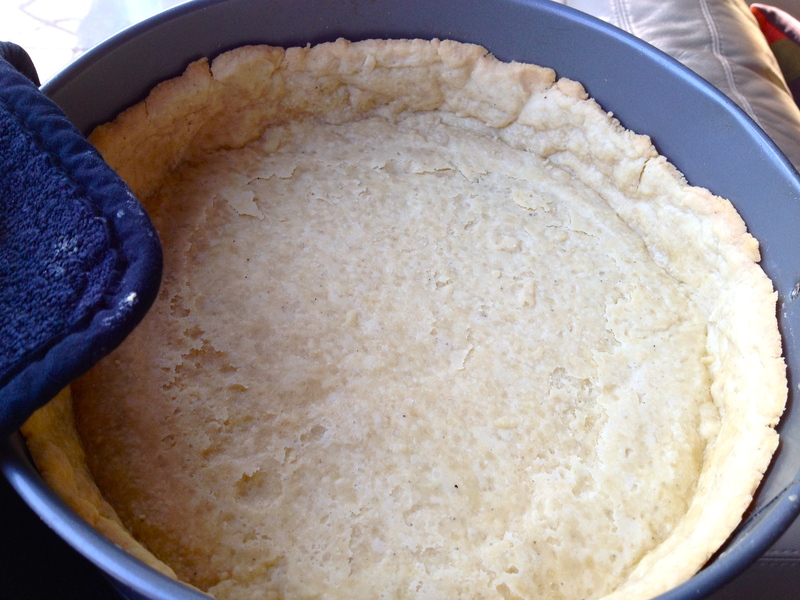 Of course, you can always use a store-bought tart crust, which would cut the prep time down, well, a lot. 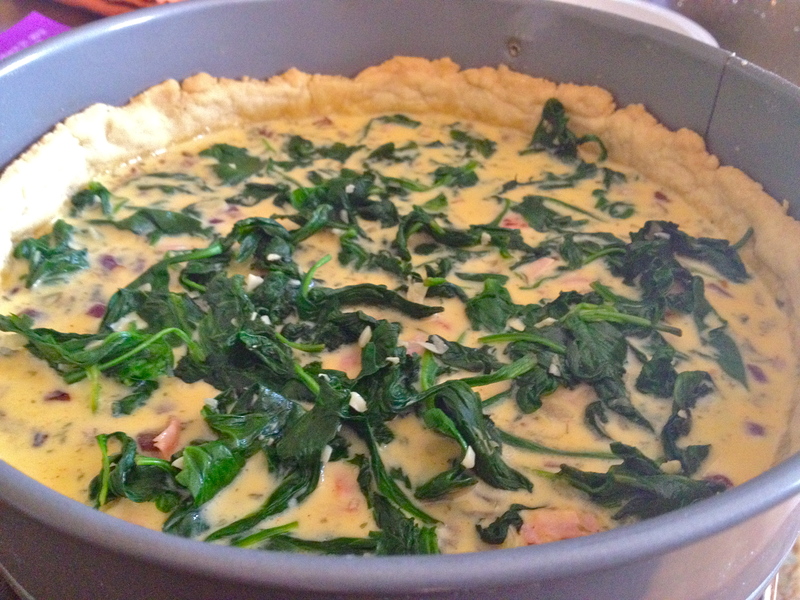 Either way, this dish combines the best of the tart and quiche worlds into one mega-brunch food. Get the crust going first. In a food processor, blitz together the butter, olive oil, salt, and pepper until the dough is the consistency of wet sand. You’re looking for the dough to just hold together, so check to see if it does. If it’s a bit too dry, add a splash or two of water at a time and pulse the food processor until the dough reaches the right consistency. Turn the dough out on to a sheet of wax paper. 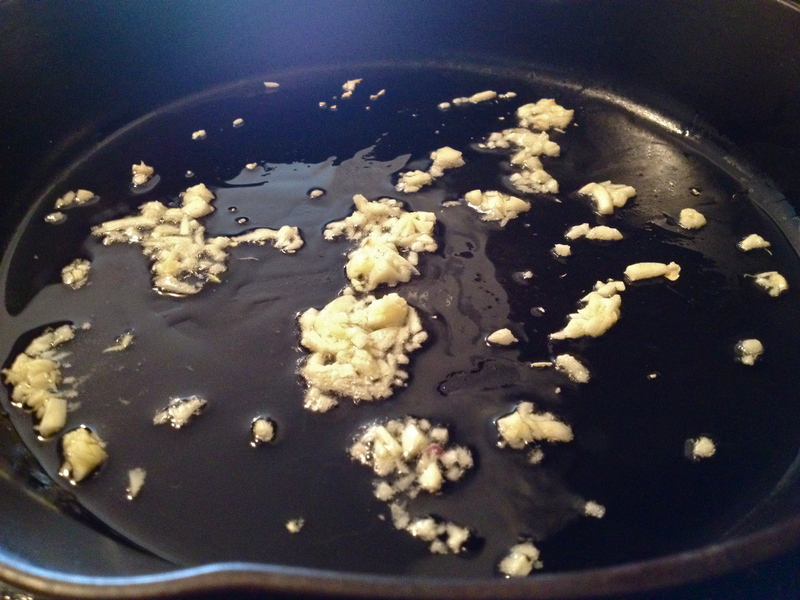 Form it into a flat disc, wrap in the wax paper, and refrigerate for at least half an hour. While the dough chills, get the fillings going. Heat olive oil over medium heat. Add garlic and cook 1 minute, careful not to let it burn. Add spinach. 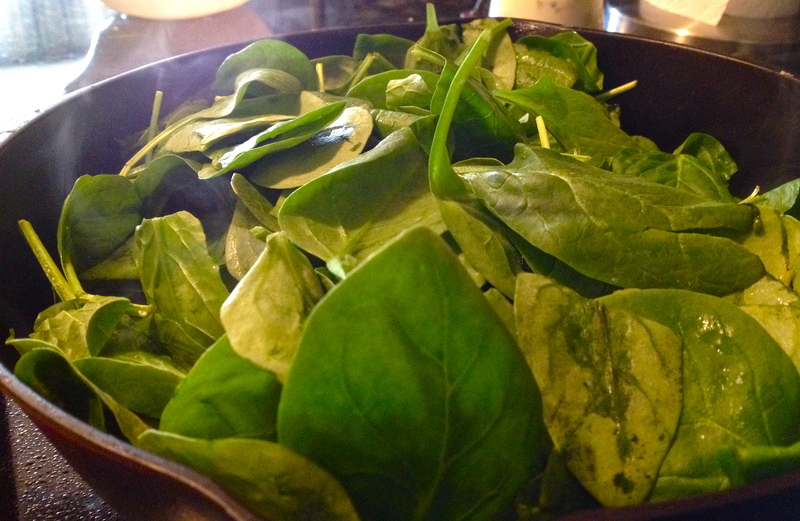 It will look like a ton of spinach, but it will cook down a lot. 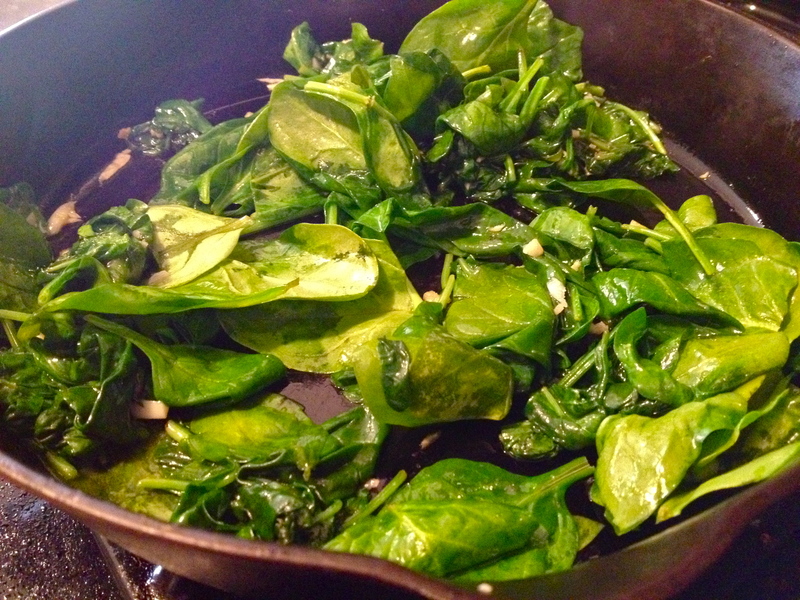 Cook the spinach, stirring, until nearly wilted. Turn off the heat and continue to stir until completely wilted. 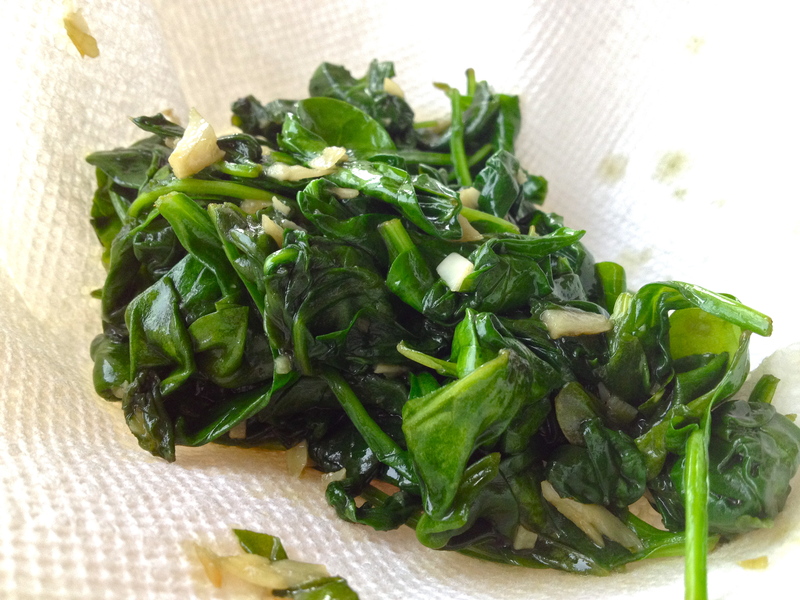 Put spinach in a bowl lined with paper towels or a washcloth (it will stain green, so use one you don’t care about). When it’s cool enough to touch, squeeze as much liquid as you can out of the spinach. I usually start with my hands and then realize that I can get more liquid out if I squeeze it between two dishes. Once you’re satisfied that you’ve gotten enough water out, set aside. 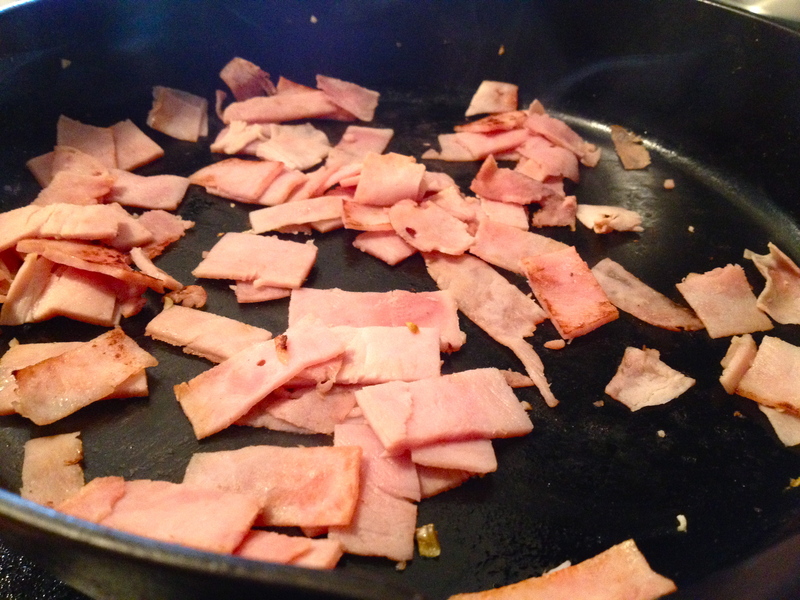 Heat the same pan over medium high and cook the ham, just to give it a bit of color on each side. Set aside. Finally, cook the onions. They’re best cooked last because they can soak up all that flavor goodness leftover in the pan after the ham! Add a bit of olive oil and cook until softened. Set aside. 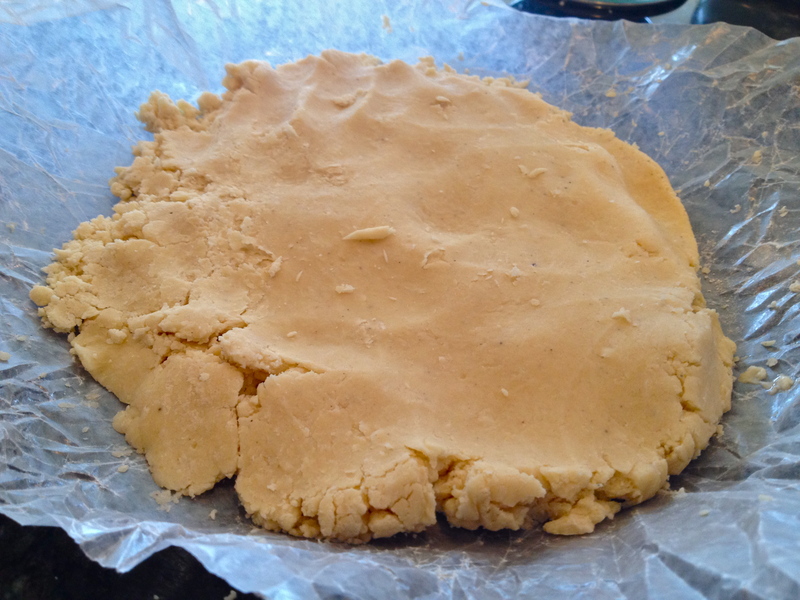 When 30 minutes have passed, take the tart dough out of the fridge. Let it sit 5 minutes before you roll it out on a floured surface. Then roll it to the general shape of the pie dish you’re using (I used a spring-form cake pan because I left my tart shell at my apartment – whoops). Drape the dough over the pan and use your fingers to press it into shape. This step always take me a while because I’m not very good at getting the dough to stay in one piece while I’m moving it! Notice how I have no photos of this; I get distracted. A good trick is to roll the dough onto your rolling pin and move it that way, but even this doesn’t make my life much easier. Look at it this way – it’s food. Who cares if your tart shell is a little uneven? After you’ve gotten the tart shell into the pan, put it back in the fridge for 15 more minutes. When the shell is chilled, put a sheet of parchment paper on top of the dough and fill the shell with dried beans, or something else heavy. When I don’t have my baking beans on hand, I use another smaller pie pan. Bake the crust for 20 minutes, until just starting to turn golden. Remove from oven and remove the beans and parchment paper. While the shell bakes, mix up the liquid part of the filling. 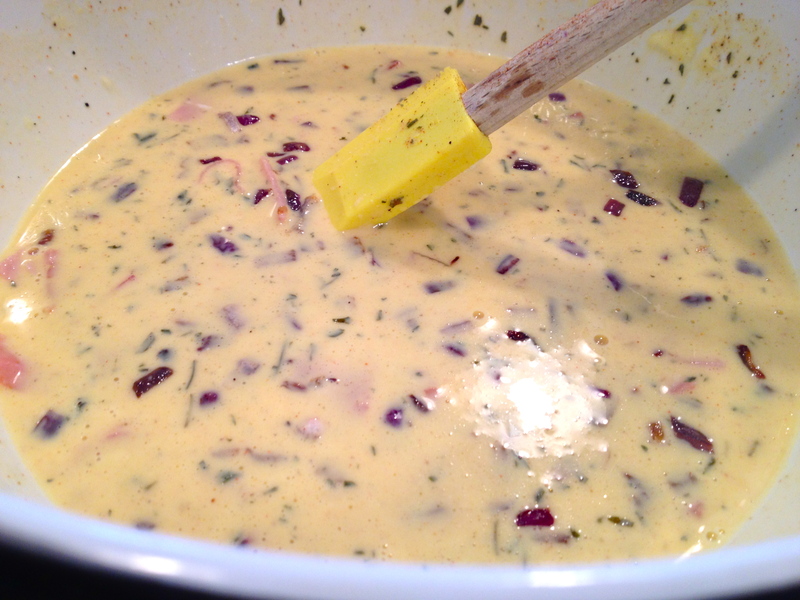 Whisk together the yolks, egg, yogurt, and stock. Add parsley, paprika, mustard powder, and salt and pepper to taste. 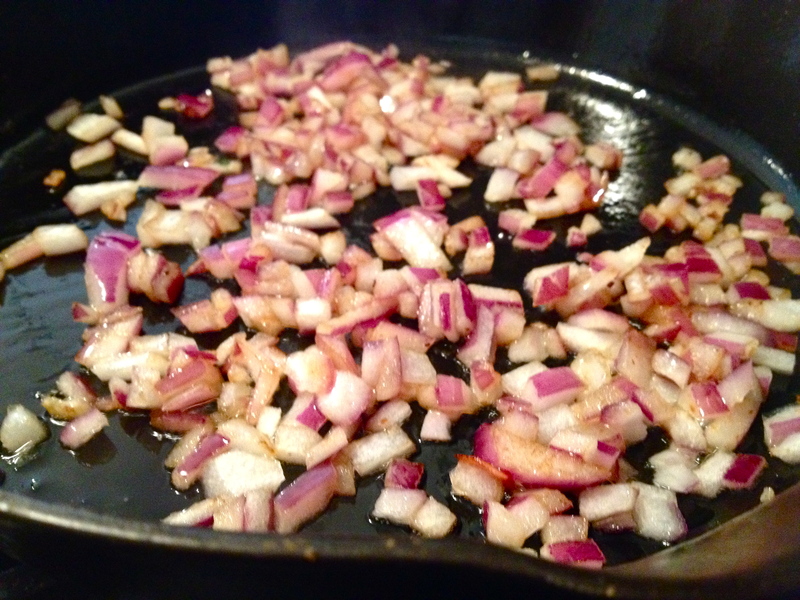 Stir in the onions and ham, and set aside. Pour the filling into the baked shell. Scatter the spinach evenly over the top. 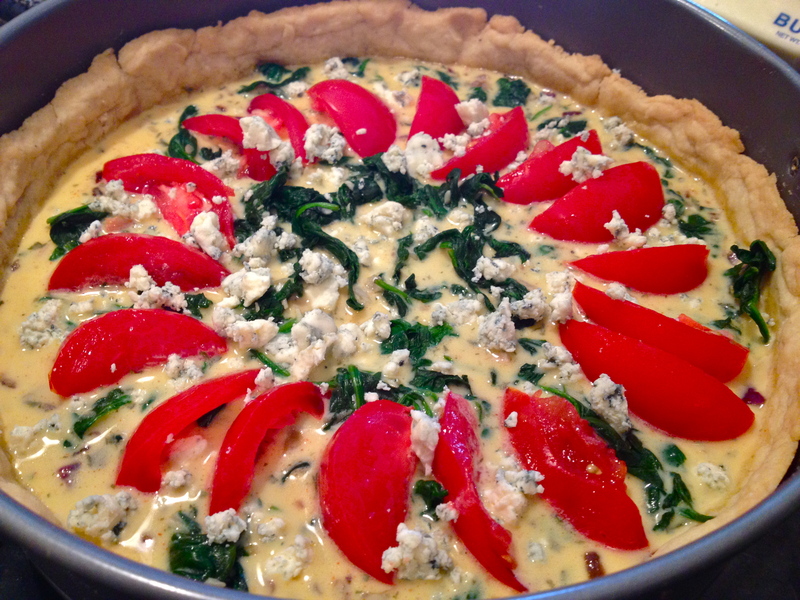 Lay the tomato slices on top in a circular fan pattern, and top with bleu cheese. Be careful not to use too much cheese; the other flavors are delicate, and too much bleu could easily overwhelm the tart. See this picture? I used just a bit too much, so learn from my mistake! Drizzle the tomatoes with olive oil, season with a bit more salt and pepper if you like, and pop it back in the oven for about 25 minutes, until the filling has set. Serve immediately; also good at room temperature. Previous Souffled Omelet with Sweet Peppers and Asparagus.